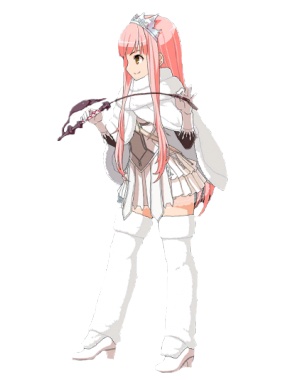 This article is about the 5★ Queen Medb. For the limited 4★ , see Queen Medb (Saber). Apply Debuff Immunity to yourself. (3 turns). Restore HP each turn (3 turns). Increase own NP gauge per turn by 10% (3 turns). Deal significant damage to one enemy. Overcharge: Decreases their Mental Debuff Resist (3 turns). 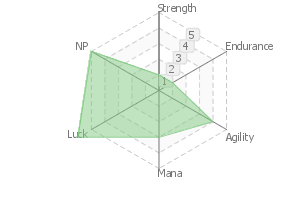 Increase Party's NP gain by 15% while on the field. The queen of Connacht in the Ulster Cycle of Celtic mythology. A young girl of many lovers who betrothed, wed, and sometimes even had physical relationships with many kings and heroes. She was the one who caused the greatest war of the Ulster Cycle. She also tried to take the life of Cú Chulainn, the warrior that defied her. Born with the perfect body of a goddess. Innocent and pure. Wicked and lustful. Both are her true nature, and neither is a lie. It just so happens that the majority of people's impression of her is the former. She purely devotes herself to endless lust, and does her wicked deeds with endless innocence. She loves good men. She really loves strong men! In life, she never once went against her own desires, and made many men her own. Fergus, the owner of the sword Caladbolg, was one of her lovers. She also loves treasure, and for that reason she started a war against the entirety of Ulster, riding in a chariot and leading the forces of Connacht into battle. "I don't mind making enemies. But I couldn't stand the fact that the one man I wanted but could never have, stood with the men of Ulster. I takled to him. I invited him. And not only did he not accept me, he gave me this look like, 'What are you doing?'" "I'll make him pay. I'll make him pay! I'll make him pay! I'll make him pay! That man..."
"Cú Chulainn of Ulster! 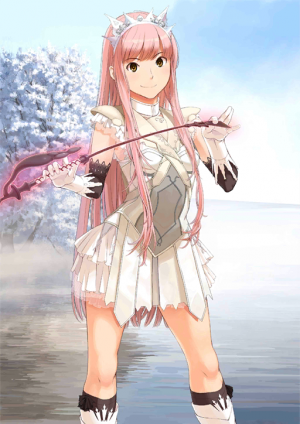 I swear by my name as Medb, the ruler and lover of all men, I will make you succumb to me!" 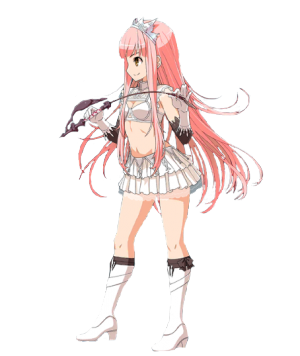 Medb is said to be the mother of many warriors, but she doesn't actually give birth to them. After taking the genetic information of a warrior, she replicates the information inside her body. Then by pricking her index finger with a blade and letting a drop of blood fall to the ground, her blood becomes a large pool where the warriors are "produced." In the most literal sense, she is the queen and ruler of nameless soldiers. In modern day Ireland, there are reports of people claimimh "I saw her" in real life. Of course, those are by no means jokes. Even now, Queen Medb lives within people's hearts as the eternal lady. The queen of Connacht that appears in Celtic Mythology, the Ulster Cycle. A young girl of affairs who built engagements, marriages and, at times, nothing but carnal relations with many kings and brave warriors. The eternal lady. The ringleader who caused the greatest war of the Ulster Cycle, she aimed at the life of the brave warrior of Ulster that defied her - Cu Chulainn. She possesses a goddess-like perfect body from birth. Pure and tidy. Lewd and devious. Both are her true faces, and it's not like either of them are a lie. It is just that the "impression" many people catch is the former. She just earnestly, tidily enjoys lewdness, and purely performs deviousness. She loves good men. She really loves strong men! Not going against her own desires at all, she made many men her own while alive. The owner of the magic sword Caladbolg, Fergus, was one of her lovers. She also really loves treasures, and for that reason she triggered a great war with the entirely of Ulster as her opponent and commanded the Connacht troops while driving her own chariot. "I don't hate being antagonized. However, I cannot tolerate the fact that, among the men of Ulster, there is one man - and one alone - who did not become mine even though I thought 「I want him」. Even though I called out to him, tempted him. That attitude in which, let alone be swayed, simply said 'what the heck are you doing?'" "I won't forgive him. Won't forgive, won't forgive, won't forgive, won't forgive, won't forgive! Absolutely, not him!" "Cu Chulainn of Ulster! 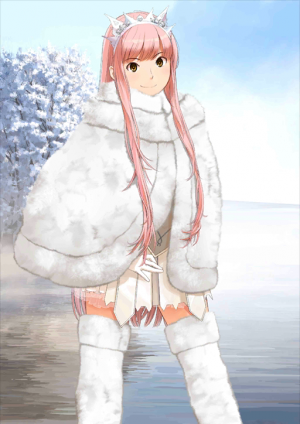 By the name Medb, the lover and ruler of all men, I swear! I'll surely make you succumb to me!" 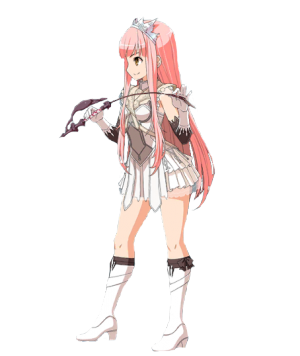 Medb has been referred as the mother of many soldiers, but it is not like she actually gives birth to those soldiers. After taking in the genetic information of warriors, she reproduces those inside her body. By wounding the tip of her index finger with a blade and having that blood fall on the ground, what was no more than a single drop becomes a great puddle of blood and soldiers are "manufactured" along with the blood foam. 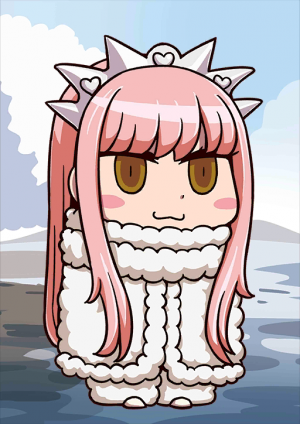 Medb is literally the "Queen" and ruler of nameless soldiers. Even in modern Ireland, there are many witness reports that say "I saw her". Of course, those are by no means jokes. Even now, Queen Medb lives on the hearts of people as the eternal lady. Although her fixation regarding Cu Chulainn still remains, her wish for the Holy Grail is unrelated to him. "To make all superb men of past, present, & future into my lovers". If possible, a brave warrior who is generous, not envious and knows no fear. 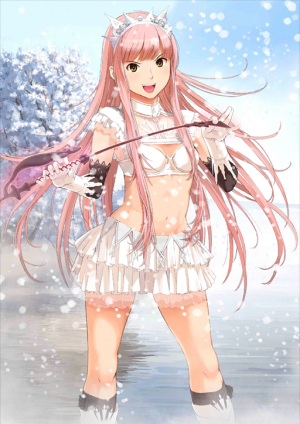 If the Master is a brave man who measures up to her, it is probable that Medb will lavishly slap her love onto him with all her energies, without minding public attention. Sternly, relentlessly, just like the whip she holds. This page was last modified on 18 December 2018, at 13:30.